A popular Japanese snack, takoyaki is usually made out of wheat flour batter, tempura scraps, green onions and the diced tako (octopus), brushed with takoyaki sauce and topped with dried bonito fish flakes. Served hot, these octopus balls are absolutely delicious! Grilled egg is delicious in any part of the world so naturally this is a winner! Tamogoyaki or dashimaki is usually served during breakfast and is commonly referred to as a kind of Japanese omelette that is rolled to achieve layers and fluffiness. 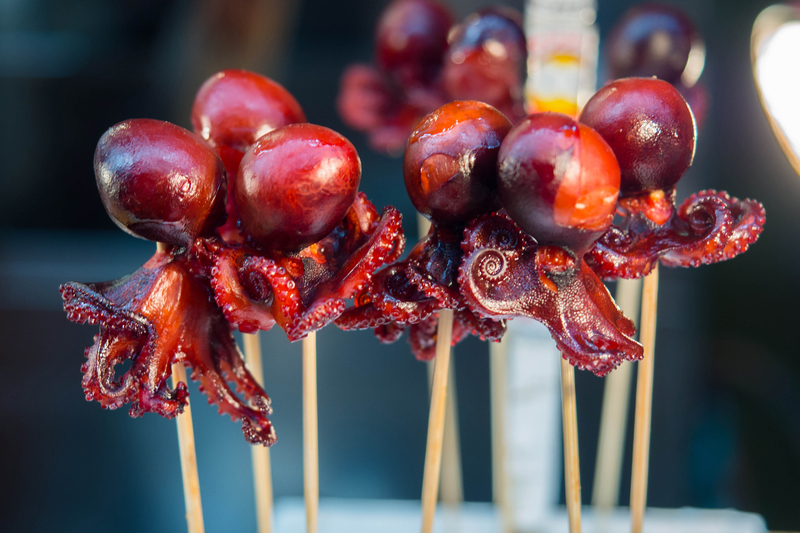 Tako Tamago is literally a candied baby octopus with a boiled quail egg stuffed in the head! It is a delicacy that you can find at the popular Nishiki Market and is known for its chewy taste with hints of salty and sweet! Savory Japanese pancakes that are famous in the Osaka and Hiroshima regions, okonomiyaki was initially prepared in Japanese homes to use up leftovers. They have since become popular all over Japan. Okonomiyaki is a kind of savory Japanese pancake topped with shredded cabbage, Udon noodles, green onions, seafood, cheese and garlic. There are two main varieties depending on where you eat them: Osaka-style and Hiroshima-style. Osaka-style okonomiyaki or kansai-style okonomiyaki is generally prepared by mixing the batter and ingredients into the bowl first before cooking the base while Hiroshima-style okonomiyaki consists of the batter only being fried as a thing crepe followed by placing the ingredients on top. 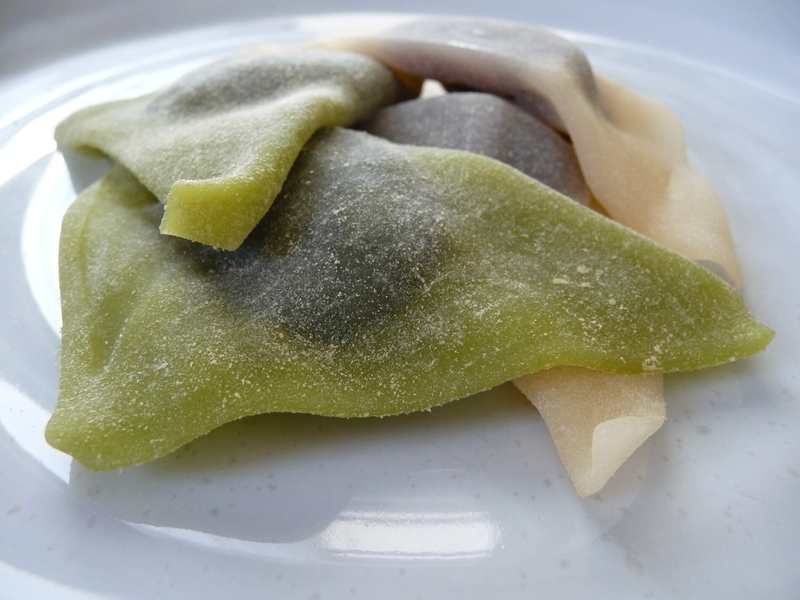 Matcha is the Asian word for green tea so you can probably guess what this is… yes! 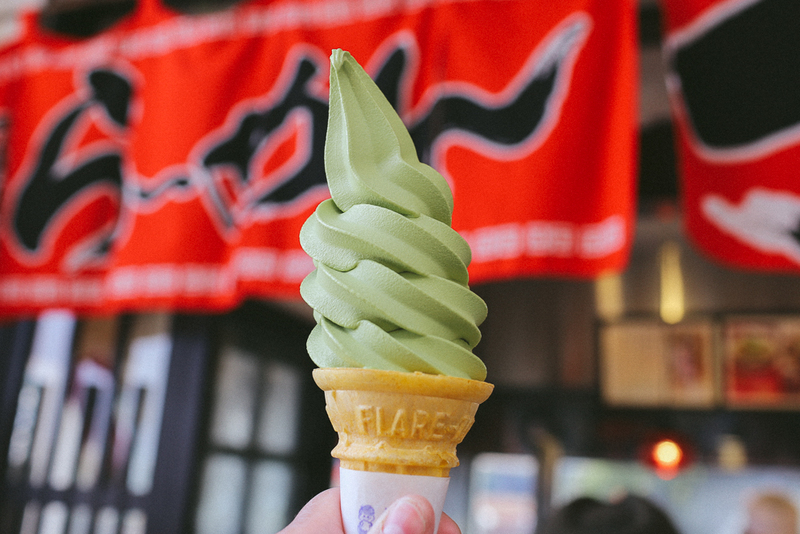 Green tea ice cream! It’s a bit of an acquired taste as matcha flavored anything is always bitter but you can’t visit Japan without having tried matcha ice cream. You can’t visit Japan and not have tasted ramen! Your bowl of ramen will be made differently depending on which particular city of Japan you’re in but every bowl consists four main ingredients – a flavored broth, seasoning, noodles and toppings of pork and half cooked egg. Yum. Japan is known for their weird and wonderful flavors and since I love chocolate, I was delighted to see so many different flavors of KitKat everywhere I went. From matcha to strawberry to cherry blossom, the flavors of KitKat are endless! Tempura is one of the top three classic Japanese dishes that any traveller should try when visiting Japan. Imagine deep fried vegetables, fish, shrimp… literally anything coated with a crispy batter and served over rice is delicious. Kobe beef is a special grade of beef that originates from the Tajima-gyu breed of cattle. This breed is usually found in the Hyogo Prefecture where Kobe forms the capital city. Tajima-gyu cattle became isolated from many of the other breeds during the second century and were said to be hiding in the mountainous regions of Japan which eventually led to their unique taste and texture. Yatsuhashi is a mocha-like dessert and forms one of Japans most popular souvenir sweets. It is made from glutinous rice flour, sugar and cinnamon and usually filled with a red bean paste. I'm Shalinee - a Geminian scientist who loves to travel, write, draw and eat chocolate. I've visited over twenty countries, published a Environmental Science encyclopaedia and somewhere along the way started a science communication company to help students and corporates translate that hard-to-read data generated in a lab. Other than that, I'm just searching for the magic still hidden in the world. Nice sum-up! Leaving to Japan shortly and this will be a great guide into the famous Japanese culinary world! Oh yay for Japan! What do you have planned Ruta? !